If I could have every single one of these sandals, my life would be made haha! I am a huge shoe lover. With that being said, I love shoes that are affordable but also good quality! I have tried most of these brands and have nothing but good things to say about them. I personally own #3 in black and really want the pink pair! I think #2, #5 and #10 are my top faves!!! But I honestly love them all! If yall have any requests for next week's Friday Favorites post, please send them my way! I love hearing from yall! How cute are these shorts?? They are seriously perfect for the 4th! I fell in love with the embroidered detail around the hem. They are $24 and half off with code "GIMME50"! Making them $12!! Size down though, these babes are huge! Not even the washer and dryer will shrink them haha! This is the same tee I wore in last weeks post! It's on sale for $9 and is in stock in all sizes! Also comes in 3 other colors. Go up a size or two if you want it to fit looser so you can knot it like I did here :) I'm also wearing the earrings I was talking about in Friday's post! They are $10 and SO light-weight! I need to order more colors!!! This will most definitely be my 4th of July outfit!! 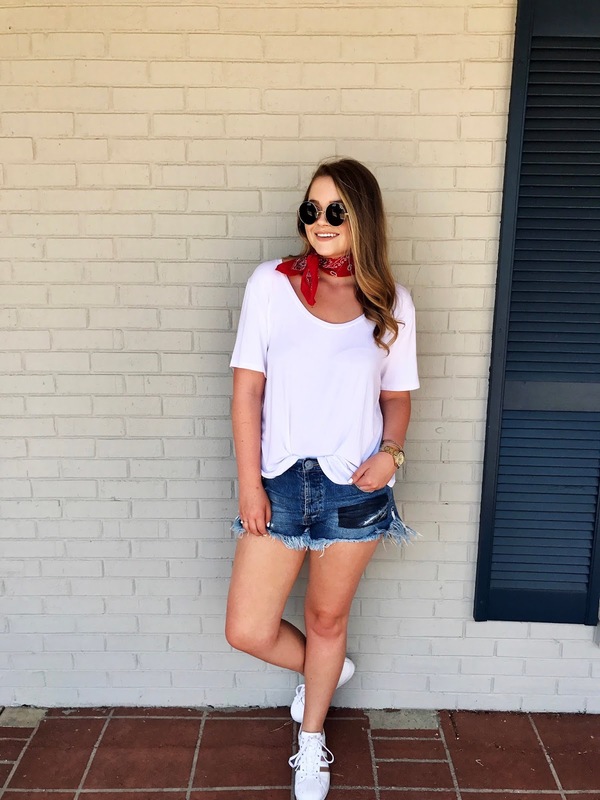 I think the bandana trend is SO cute and fun!! Anyone could rock it! The one I am wearing here is only $6 and comes in blue and white, too! 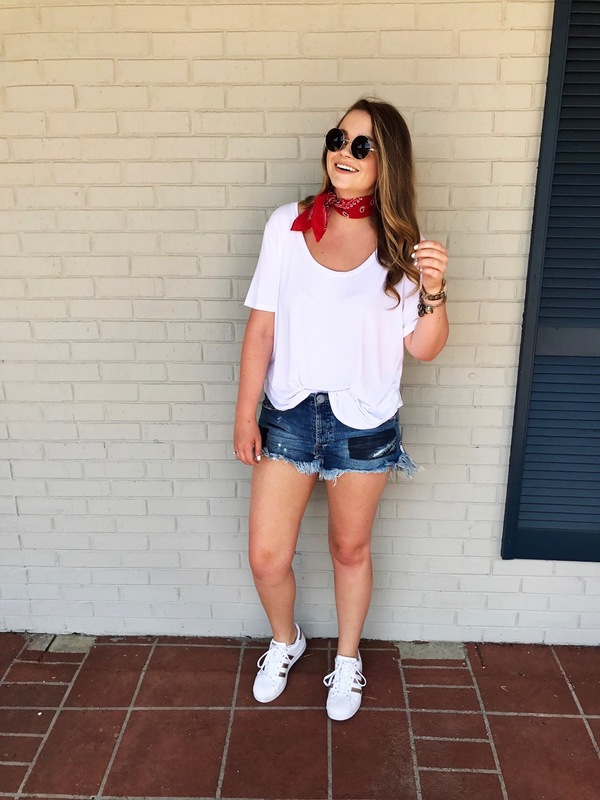 I really wanted the blue but thought the red would look better for this look :) A basic white tee is a major summer staple, and this one is my favorite!! It's on sale for $10 and in stock in all sizes...I recommend going up at least once size for a more loose fit. Also, these shorts have been on repeat like everyday..haha! They are true to size if not a bit roomy. Sizes are very limited but check back every day because they restock often! 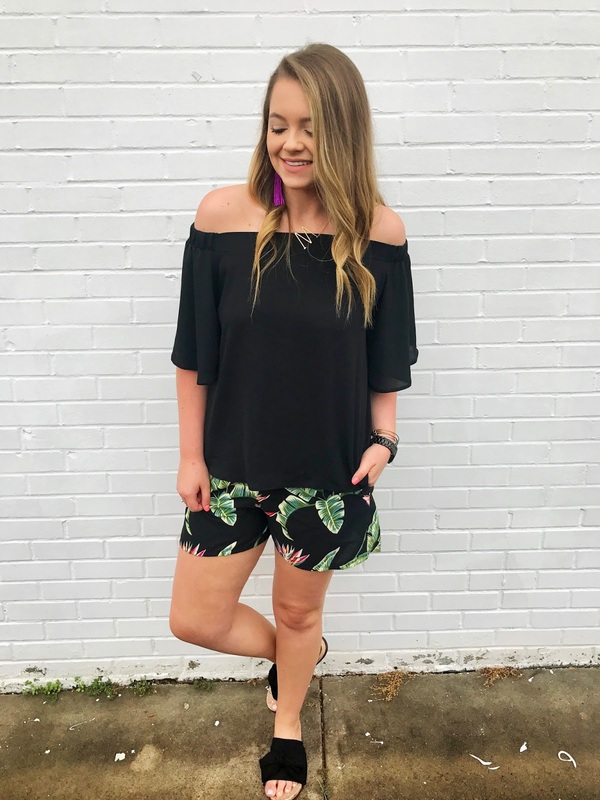 Seriously yall - this brand of shorts has completely won me over. They are worth every penny!! My adidas have been getting a lot of were lately, too. I think they go perfectly with these shorts!! So if you're looking for a casual but cute 4th of July outfit - this one is a winner!!! 14. | 15. | 16. | 17. 1. I love a good maxi dress! They are so light and airy, but also cover enough for those girls that don't like to show too much skin! I love the lace detail and off the shoulder style of this one. It also comes in a few other colors and is under $40. 2. I have several shirts similar to this one!! This one seems to be more oversized and flowy - so of course I love it more!! It would be perfect with a pair of cut offs! 3. I am so obsessed with stars this season!! 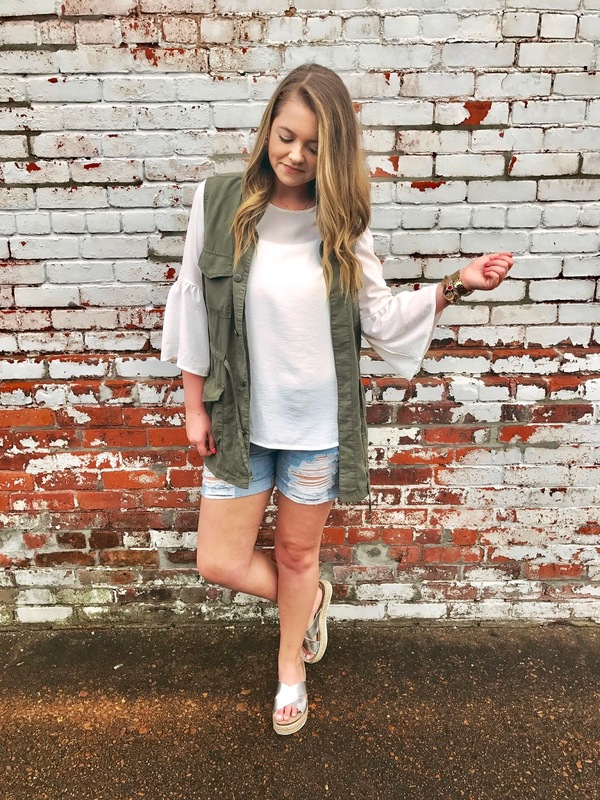 This may be my favorite casual pick from this post! Throw it on with some adidas sneaks, and you'll have the perfect laid back look! 4. I HAVE TO ORDER THIS ONE!!! It literally screams "4th of July"!! Aren't the details just the cutest?! Plus it's under $50! 5. Graphic tees are always fun on the 4th!!! I think this one is adorable! 6. Okay so I just bought the shorts that are the same print as this romper, and SHUT UP!!! I didn't know they even made it in a romper! I love the tie-halter neck..that style is so in this season! 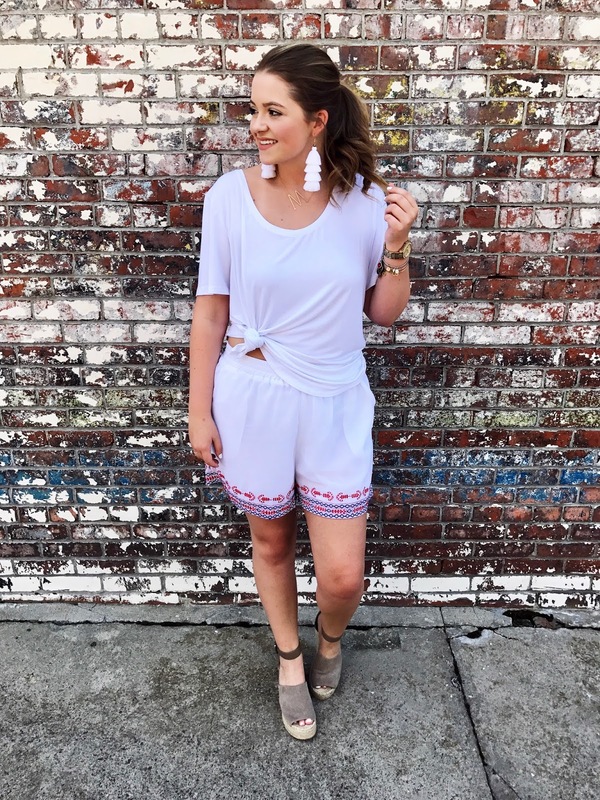 The romper also comes in red and it's under $40! 7. This tee says USA in doughnut letters...how much more American can it get?! I am loving this top so hard!!! 8. These are the shorts I was talking about in #6. They are soooo cute! I would for sure order one size down though, they were huge on me and I couldn't get them to shrink either! They also comes in red and are only $24! 9. These sneaks are aaaaadorable! I have loved them for so long - I honestly don't know why I haven't gotten them yet! 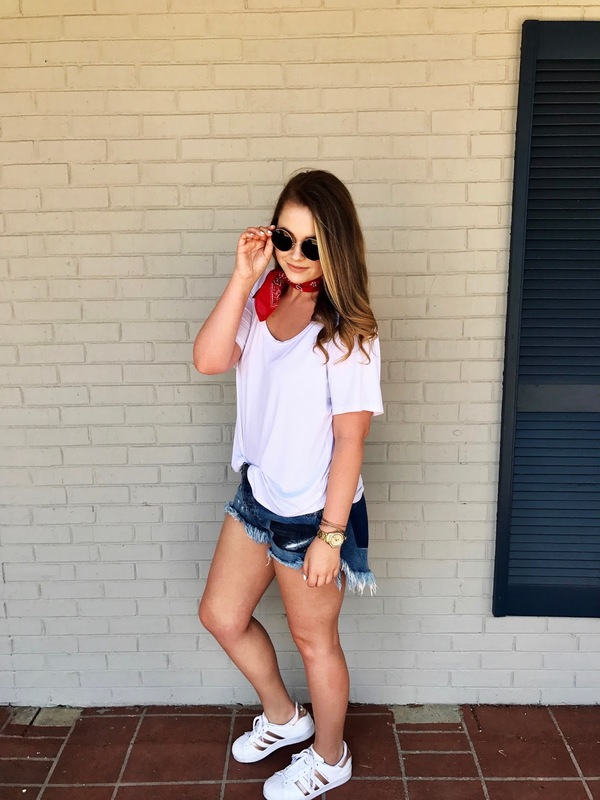 If they are anything like my favorite wedges, they have got to be super comfy! 10. 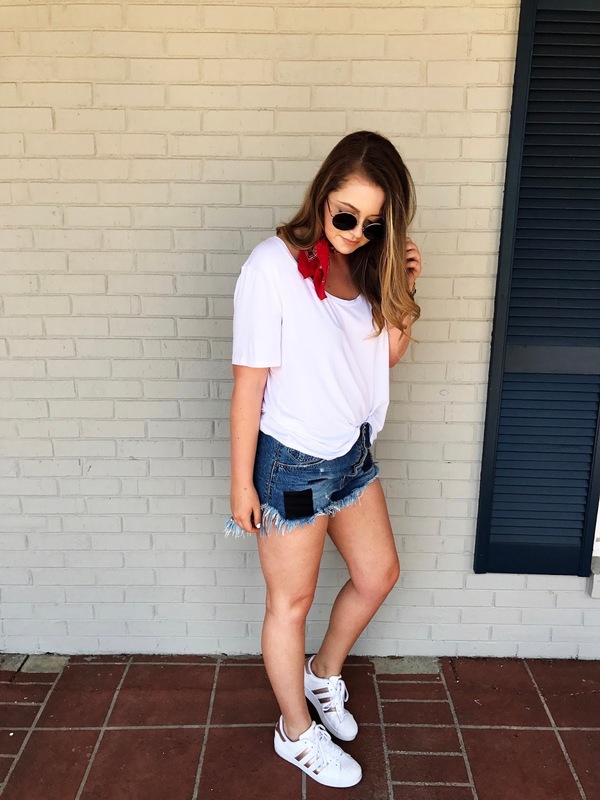 I love a good white off the shoulder top - and this one is perfect! It has the cutest eyelet detail which I think would be perfect if you were going to be outside! I think it would look so cute with #12! 11. 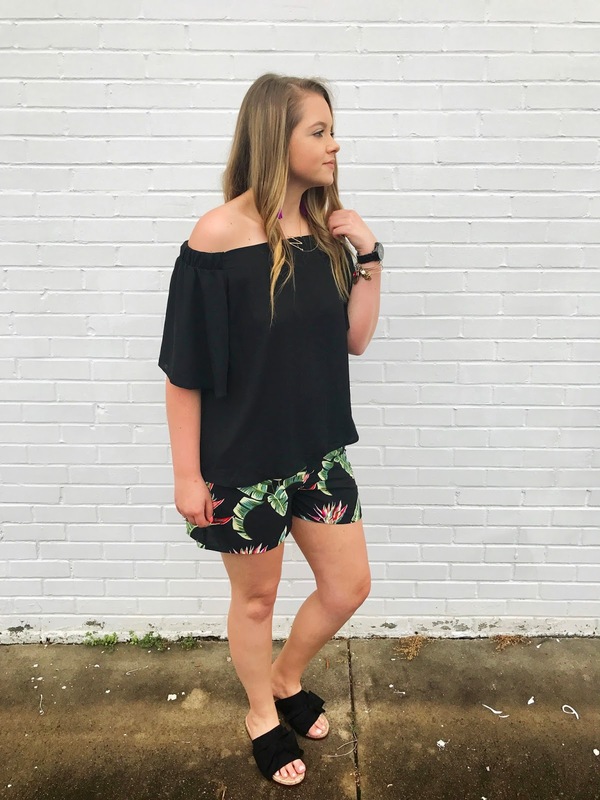 Is anyone else happy about one-shoulder tops coming back in style?! I am for sure!! I love the two-tone blue of this one. The bow is the perfect addition, too! 12. Gingham is literally the trendiest thing to wear right now!! 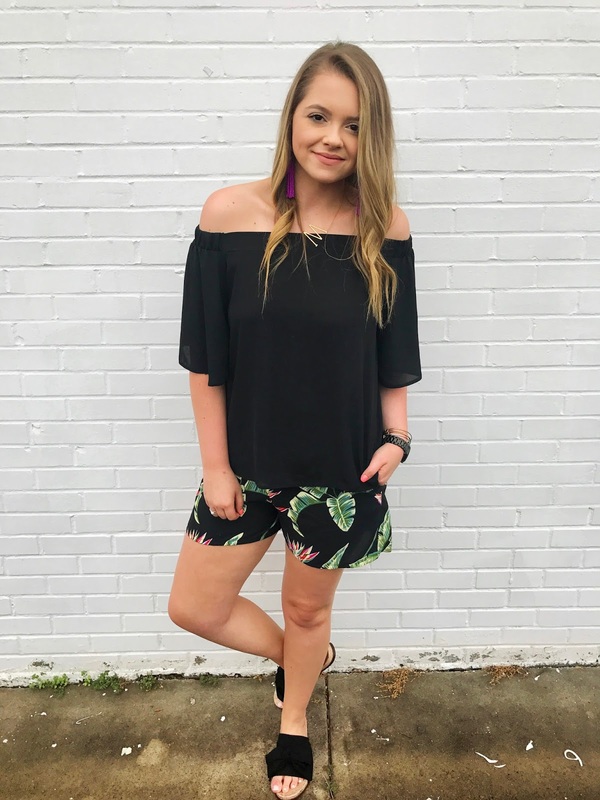 These shorts are perfect for the trend, and for the holiday!! They also seem to be a pretty good length! 13. 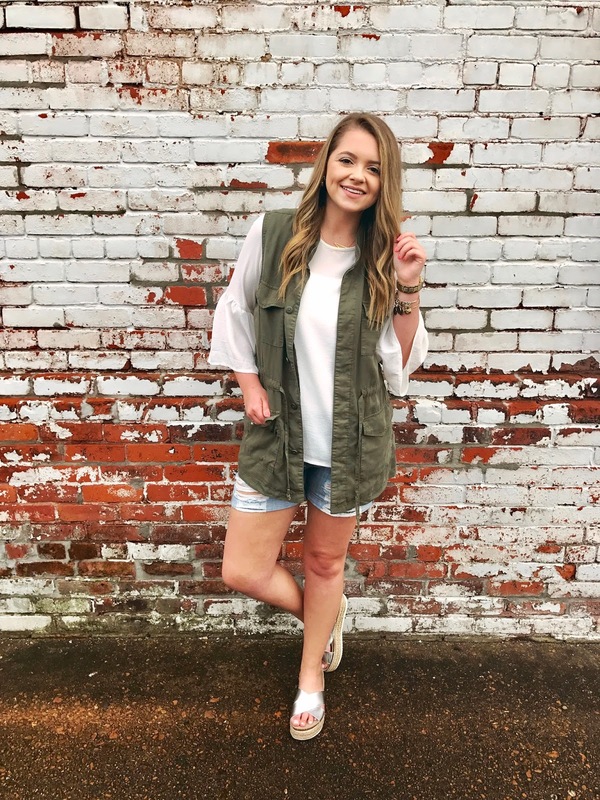 I have seen so many other bloggers wearing tops and dresses in this style, and I think it's so cute on them, but I don't think I could ever pull it off! I think this dress would be perfect for outside activities and even church!! 14. 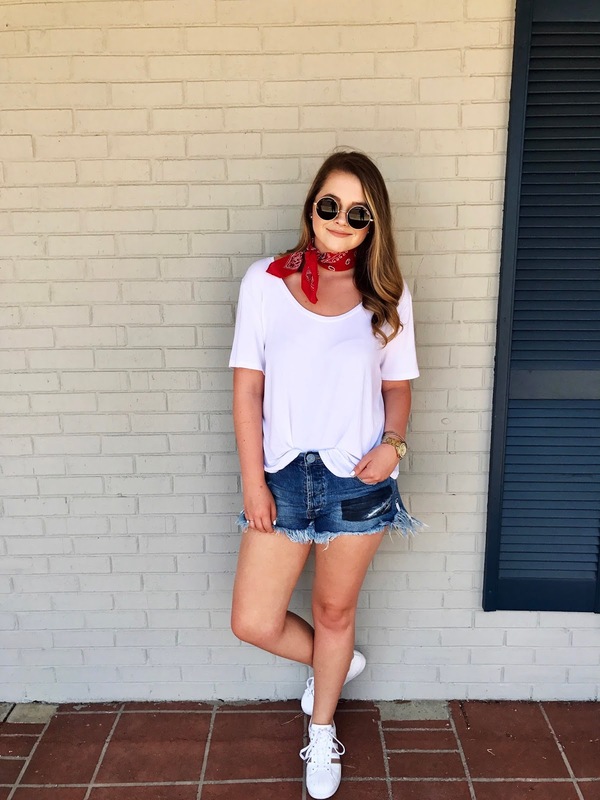 The bandana trend is MY FAVORITE RIGHT NOW!!! This one comes in red, white, and blue and it's only $6! I ordered the red one, but I wish I would've got the blue too! 15. 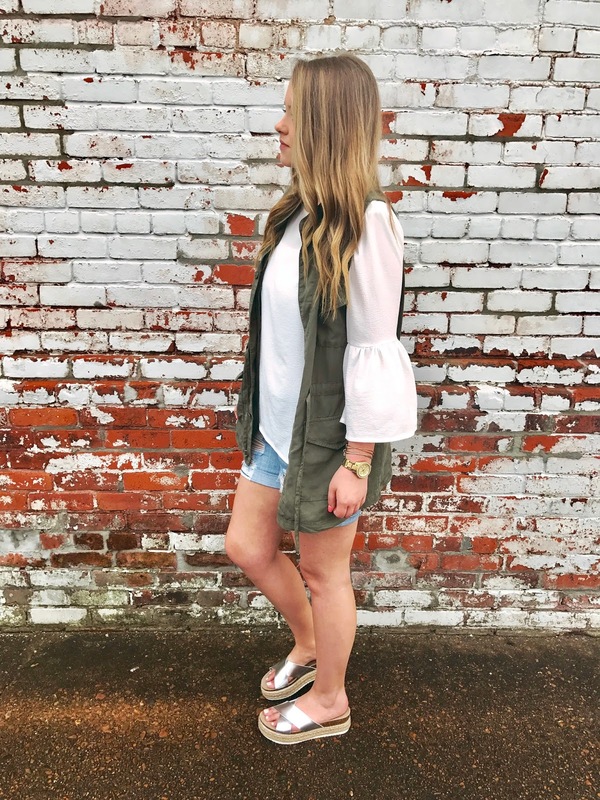 This top is three trends in one....stripes, ruffles, and a tie front! It comes in several different color options including red, bright blue, and other stripes! 16. I just got these shorts in last week and I'm already obsessed! I love the patch-work detail, style, and fit! This brand has won me over! 17. You can't really tell from above, but this top is gingham print!! It also comes in red gingham and is $40! Love the ruffle!! Okay, sorry for making this post so long and boring!! I really hope yall love my picks because I really want every single item!! If yall have any posts ideas for next week's "Friday Favorites", let me know in the comments or you can email me!! Happy Friday!! I hope yall have the best weekend!! I originally got these shorts in hopes of going to the beach this summer...but I don't think that's gonna happen haha! 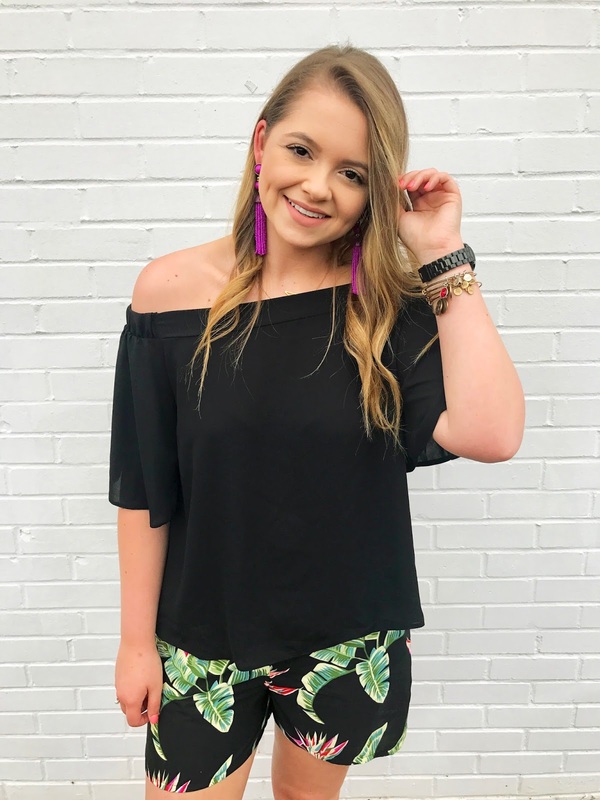 I have really been into palm print lately and I fell in love when I saw these!! The colors are so vibrant against the black! 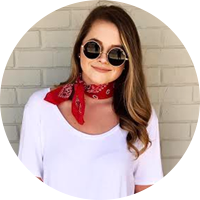 They are almost sold out, so I linked another pair that I am obsessed with! I think I like them better than the ones I'm wearing here lol! 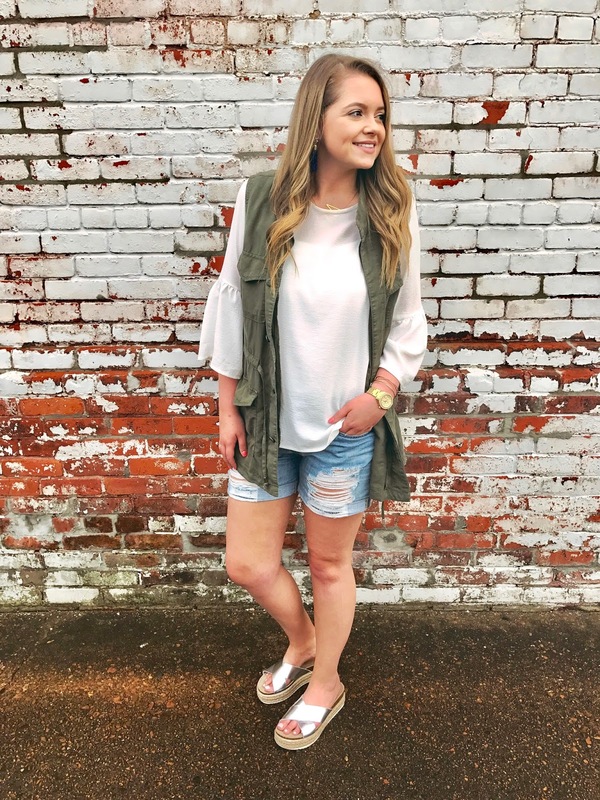 Also my top is under $30 and comes in several colors!! 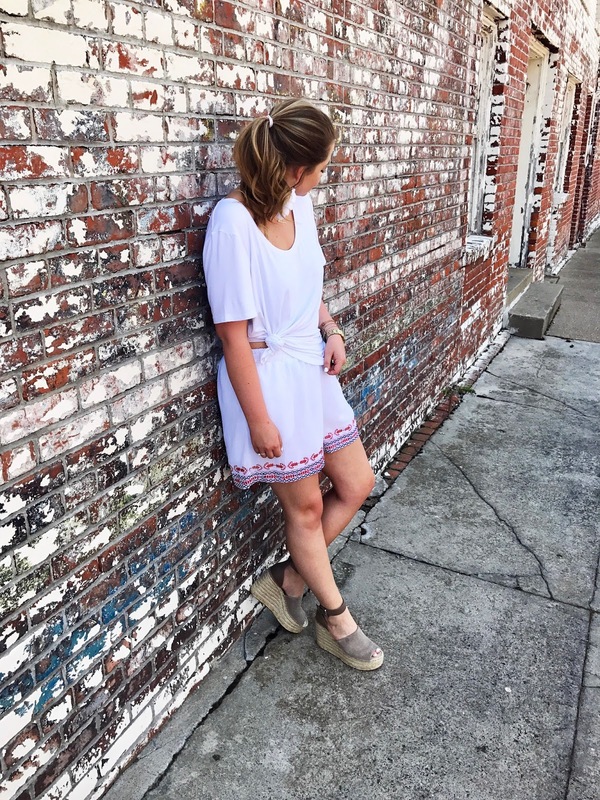 My sandals are also under $30 and come in a lot of colors - plus they are comfortable! I have heard mixed reviews on how comfy they were, but I've never had a problem!! I have decided to start a "Friday Favorites" series! Every Friday will be a different topic - this week is beauty! I don't typically post much about beauty products, so I thought this would be a good start :) If yall have any requests - please let me know!! Next week I'm planning on a 4th of July post! Each of these products are either favorites that I keep purchasing, or current favorites that I'm loving at the moment!! 1. This eyeshadow palette is amazing!! I usually do not wear eye shadow at all, but I decided to switch things up a bit and try it out!! I am definitely not an expert at applying eye shadow, but I believe this palette makes it super user friendly! I start out with the lighter shades, and then I like to use the sparkly copper tone in my crease. 2. Yall I have a secret....I do not wash my face every day....I know, I'm terrible and I really should do it! I just haven't found anything that doesn't dry my face out! I have really been wanting to try this Tula face cleaner!! I have heard so many GOOD things about that brand! Anyways, back to #2 - my boyfriend's grandmother (Hey Mars!) recommended this to me and I have been hooked ever since! I DO take my makeup off every night before I go to sleep, and I use the Neutrogena makeup wipes to do that! But after I use the makeup wipe, I use this micellar water to really get the excess makeup off. I thought for sure my makeup wipe was doing the whole job, but NOPE! I love this stuff!! It really feels refreshing and works! 3. This one is a MUST HAVE!!!! Total game changer for me. For so long, I had trouble finding an under eye concealer that worked for me. I'm not huge into makeup - well I am, but not into trying new things. I would rather spend my money and clothing and accessories lol! But I forced myself into buying this product because literally everyone was talking about how good it was! YALL..this stuff is pure magic. I cannot express to yall enough how much I love this. It has full coverage, does not cake up, and stays all day!!! I think this is my favorite product in today's post! I got the shade "Fair Neutral"
4. I'm sure all of you own a Beauty Blender by now, but if you're anything like me you may not! I have been using one for about a year now, and I'm never going to put on my foundation any other way!! I even use it to even out my concealer and bronzer!! This is a must have, too! 5. This is another product I have been loving! Can yall tell I actually bought new makeup? haha! I bought a BareMinerals makeup kit YEARS ago that had a bronzer in it, and I seriously have used it since. I decided I really needed a new one, and Courtney Shields from BYOBEAUTY was talking about this on one of her Youtube videos! I decided to give it a try and I love it!! It has just the right amount of sparkle and it goes on so well! I got the shade "Bronzed Bondi"
6. I think this is officially my favorite lip stain!! Once again, I heard so many good things about it, and everyone was wearing it, so I just HAD to try!! Yall I am in love with this! I got the shade "Angelo" and it's a gorgeous nudish-peach color! Haha - kind of hard to explain this one!! But it's literally all I have been wearing on my lips! I'm going to have to get more shades asap!! 7. This is a summer must have for me! It's a foundation with medium coverage and also has SPF in it! Great for those days when you're going to be outside for a while!! It's also gorgeous - like it gives you a very light and glowy look thats perfect for summer! In the summer months I'm usually a shade 3! 8. I have been dying to grow my hair out. After a bad hair-cut that took off WAYYYY too much hair, I started hating everything about my hair! I started taking these vitamins a little over three months ago. After taking them for two months, I got discouraged because I wasn't seeing any results. But apparently it takes at least three months for them to really get in your system and start working!! I'm now on my 4th month, and my hair looks longer and most definitely healthier!! 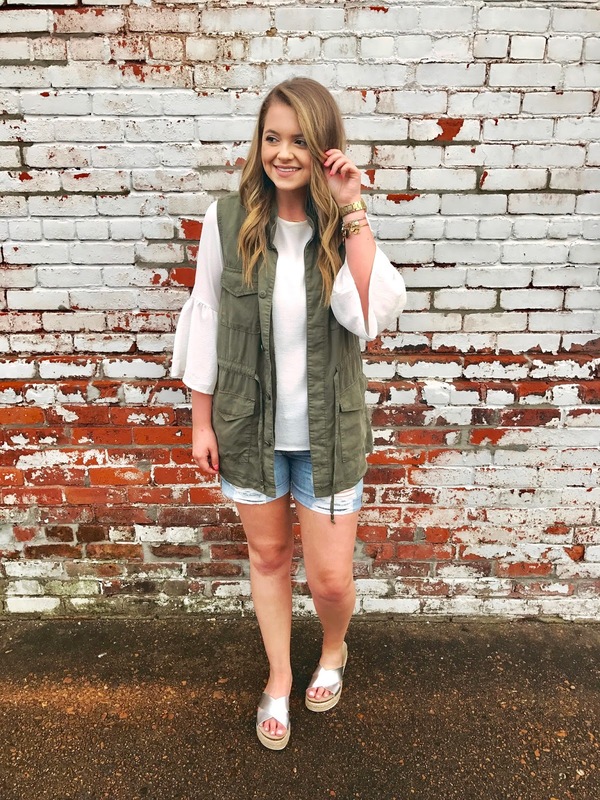 This bell sleeve top and utility vest has been my absolute GO TO the past few weeks! I've probably worn it like 5 times haha! I really love the combo of girly and causal though. Plus, there are endless ways you can style them! I wore them with some soft spring booties and jeans on a cooler night - I think that was my favorite way I styled it!! I wanted to show yall a more summery look though, so I paired them with distressed denim shorts and my new espadrille platforms!! They come in a few other colors, too! 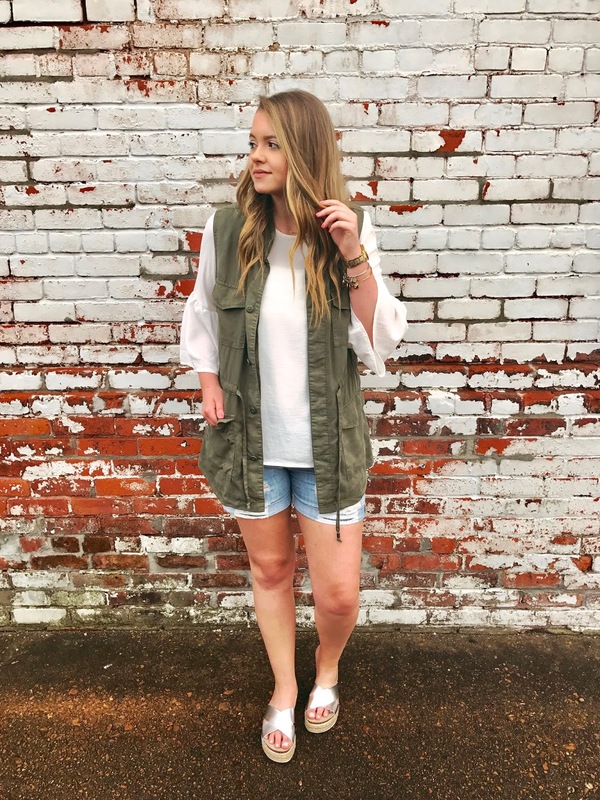 Both my top and vest are under $30! Life has been overly relaxing the past couple of weeks. I'm still waiting on my DH license so I can start working!! It needs to come fast because it's getting too boring haha! Hope yall have a great week!